Due to urgent request of colleagues in the field, we are moving the deadline of abstract submission to 30 APRIL 2014. 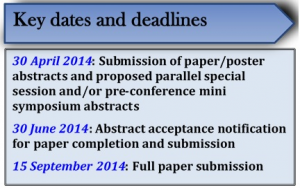 Notification of abstract acceptance for paper completion and submission will be announced on 30 June 2014. 1. Submit the paper/poster abstract online to ASAE Conference Secretariat not later than 30 April 2014. 2. The abstract should be no more than 300 words (about half a page of an A4 bond paper). 3. The abstract should contain the following information: key motivation for the study, objectives, information on the location and data used, methodology, and results. 4. The abstract should have a title and name(s) of the author(s), including their affiliation(s). Indicate the proposed paper presenter, by putting an asterisk on the author’s name. 5. Below the abstract, include at least three (3) key words and indicate to which sub-theme you want your paper to be evaluated and included for possible presentation (http://asaeweb.org/conferences/8th-asae-conference/item/9-conference-themes-and-sub-themes). Please visit our official website http://www.asaeweb.org for updates and further announcements about the Asian Society of Agricultural Economists (ASAE) 8th International Conference.